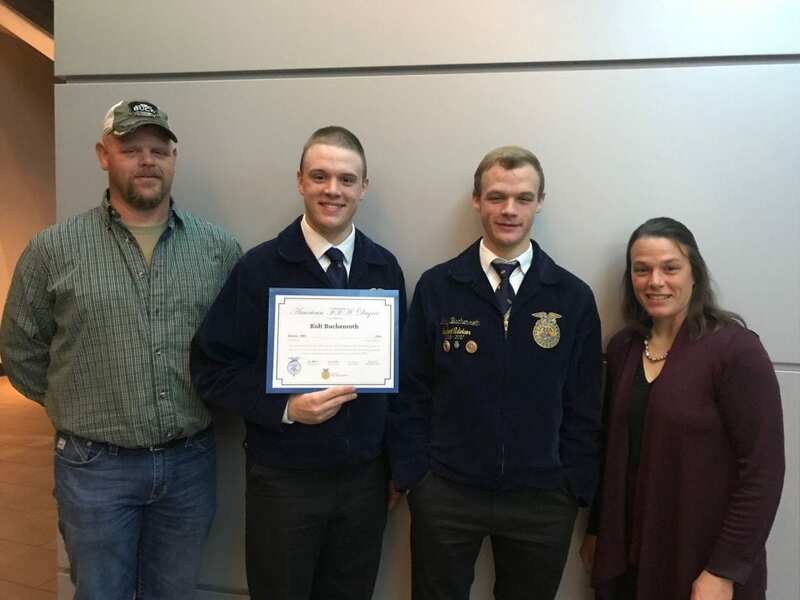 Thanks to the support of my family, friends, Kenton City Schools, Ohio Hi-Point Career Center, my advisor Mrs. Shalie Logan, and great members of the Hardin County community, I am extremely thankful to have received my American FFA Degree at the 91st National FFA Convention & Expo. I am so fortunate to have had the opportunity to participate in Agricultural Education courses in high school, and become a member of the FFA. The organization has not only opened a number of doors for me, but has also provided me with skills and knowledge that can’t be learned anywhere else. Kolt (pictured with American Degree) and his family. 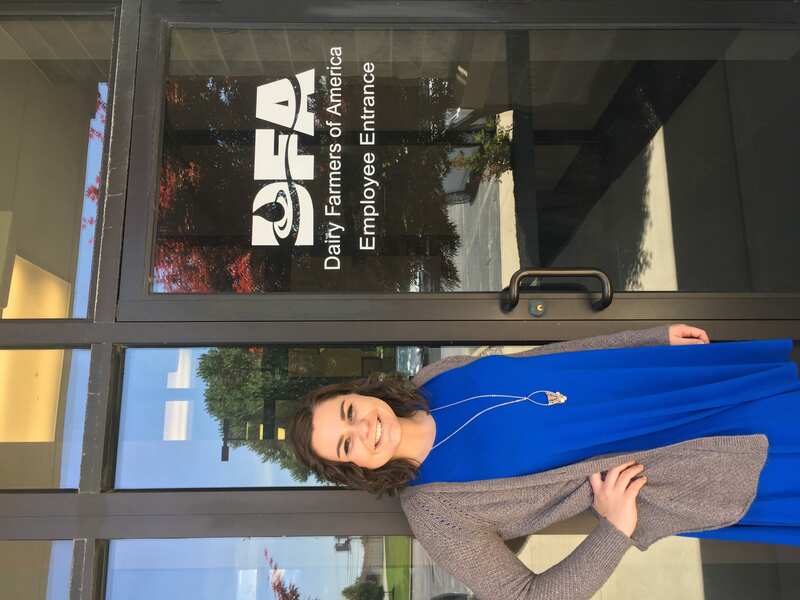 Over the summer, I worked for Dairy Farmers of America at the Mideast Area office in Medina, Ohio. My position was the communication intern, which entailed assisting the communication associate with a variety of projects. Throughout the internship, I learned a great deal about writing, designing and working with others. A major part of my internship was re-branding the member guide, the leadership directory, the employee manual and the hauler manual. I also assisted in the creation of a gold standard binder to give to members and a glossary of dairy industry terms for new employees. I completed other projects as well, such as a post card to be sent to members to encourage them to visit Farm Science Review. I really enjoyed becoming more experienced with Adobe InDesign through these projects. 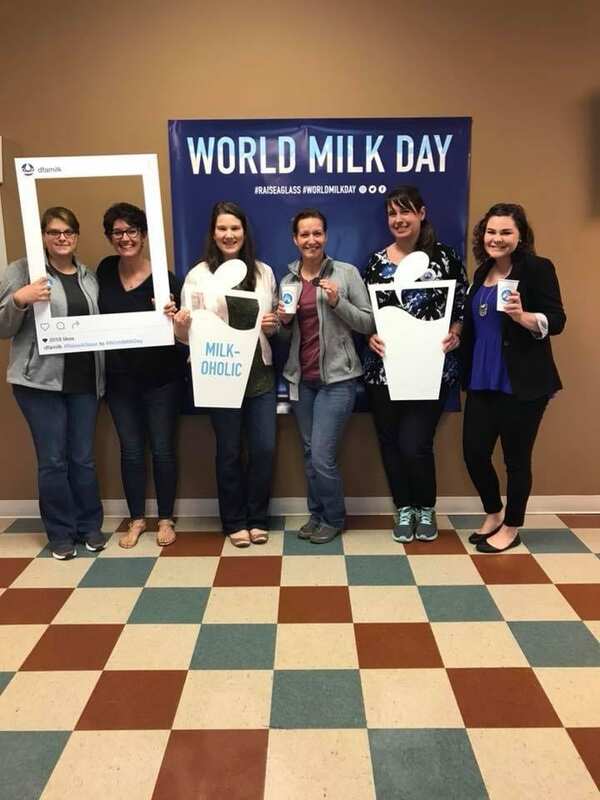 I also had the opportunity to help plan a variety of office events for June Dairy Month. I helped to create flyers and signs for these events. I especially enjoyed World Milk Day, which is pictured. I also had the opportunity to create signs and a banner for the Mideast Area Leadership Conference, and attend that conference as well. There I helped with aspects of the event, such as registering members and employees for the conference. These experiences helped me to build my skills within event planning. Writing and editing was also a skill I developed through my internship. I wrote an article for our newsletter and edited the newsletters as necessary. I also wrote for many of the projects I designed throughout my internship. This summer I had a great experience with Dairy Farmers of America. The people were one of the favorite parts of my internship, along with the skills I expanded. I was thrilled to learn more about the dairy industry and to gain more skills as an agricultural communicator. 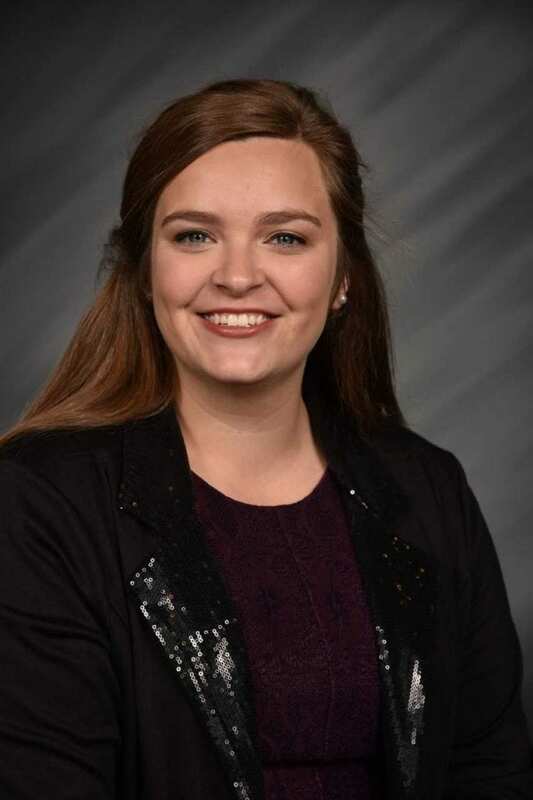 My name is Madeline Bauer and I am a 4th year studying agricultural communication with a minor in production agriculture. 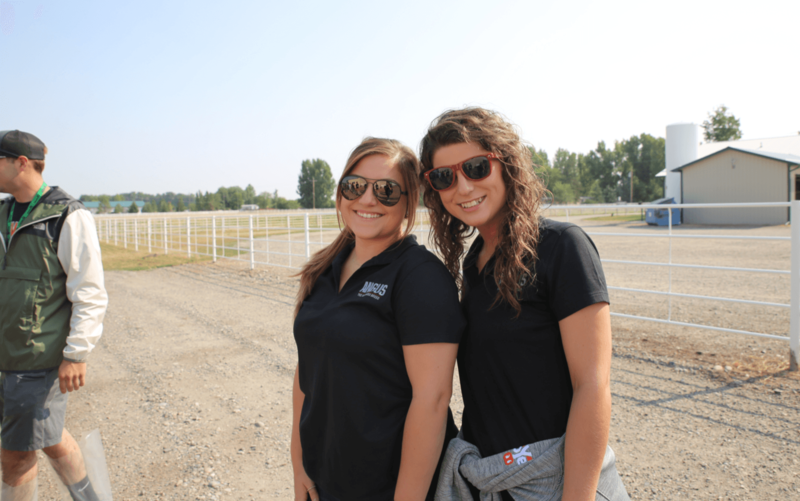 This summer I had the opportunity to work for the American Angus Association as an events and education intern. Through my internship, I traveled to Maryland, South Carolina, Ohio, Wisconsin, and Montana. In the meantime, I lived in St. Joseph, Missouri. Each trip was dedicated to something different. When I traveled to Maryland and back to Ohio the purpose was to attend regional Angus shows. My duties there was to keep an official book of all the placings and champions from each show. I also calculated the points to find the winners of the Herdsman and Premier Exhibitor. I traveled to Charleston, South Carolina to attend the June Board meeting for the American Angus Association. This was one of my favorite trips as I got to act as a tour guide for all the spouses and children of the board members and employees. So while they sat in meetings all day I got to explore Charleston with the spouses and children. I took headcount on all the busses and was there to give updates on the plan for the day and ask any questions they might have and I executed the plan that was already in place every day. Probably the biggest event of my summer was the National Junior Angus Show held in Madison, Wisconsin. I prepared all summer by organizing contest boxes, wrote Quiz Bowl tests and I made the entire Skill-A-Thon contest from scratch. At this show we had over 1,200 head of cattle come to Madison. I was in Wisconsin from July 2nd – 15th. There were numerous things I did in those two weeks but the main thing I did was facilitate the almost 20 contests that we have outside of the show ring. My job was to make sure the contest rooms were set-up, I prepared my judges on how to use the scoresheets and the rules of the contest. I had to know the rules of each contest like the back of my hand because I was the contact person for parents, exhibitors, and judges who may have questions about the contests. Last but not least I ended the summer with a trip to Billings, Montana for the annual LEAD conference. This was a conference for junior members to attend to learn from industry professionals and view different Angus facilities. At this event, we attended a few different bull testing facilities and ranches. I had never been this far west and I can say that Montana is truly breathtaking. I see why they call it the Big Sky state! 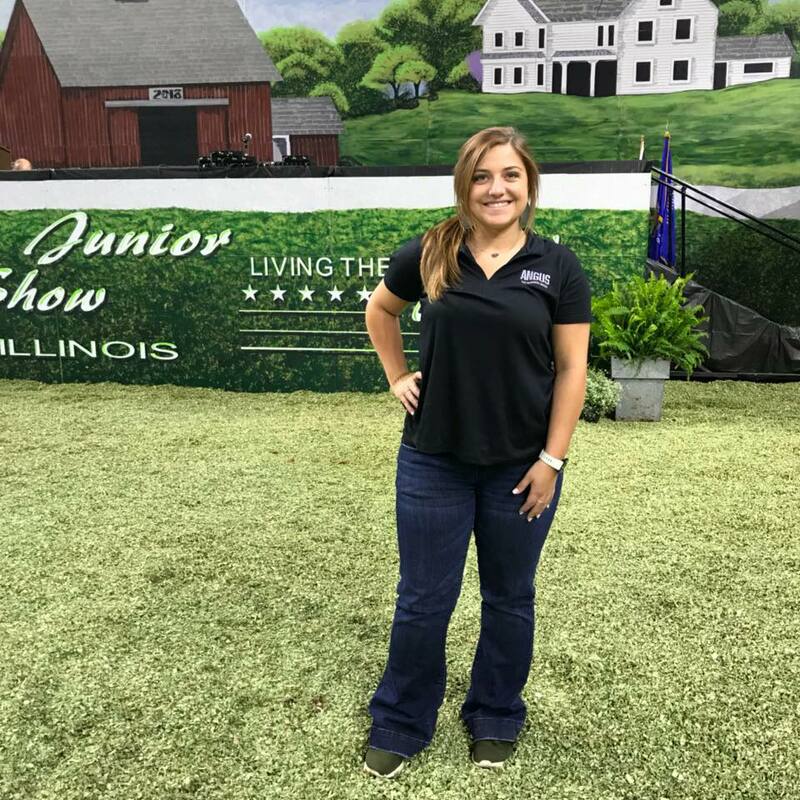 Overall, I truly loved my experience at the American Angus Association and can say that my time there made me a better professional and prepared me for my future career in so many ways. This summer, my final internship was with OSU Extension Marion County. My mentor was ACEL graduate, Margo Long. 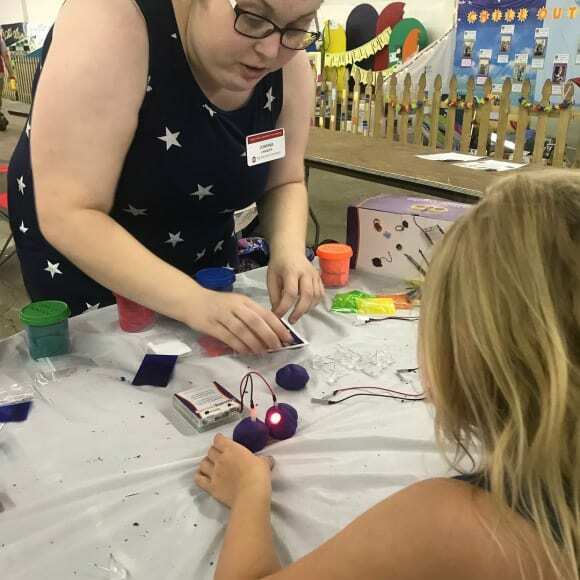 Prior to this internship my only knowledge of OSU Extension was its role in 4-H, but through this experience I had the chance to learn its many other functions. I started working at the Marion County Extension office on June 4, 2018 with an internship orientation at the 4-H Center on The Ohio State University campus in Columbus. After the training day, I jumped right in to working on projects and assignments from Margo. I wrote lesson plans for activities that were completed at the Cloverbud Day Camp, painted the picture frames given to the Cloverbuds and created examples of crafts to show the Cloverbuds. During my first week, I was able to attend meetings with Margo including a Marion County Senior Fair Board meeting, a camp counselor meeting and a meeting with the director of the new Children’s Museum in Marion. The next week I was able to assist in running the Cloverbud Day Camp. 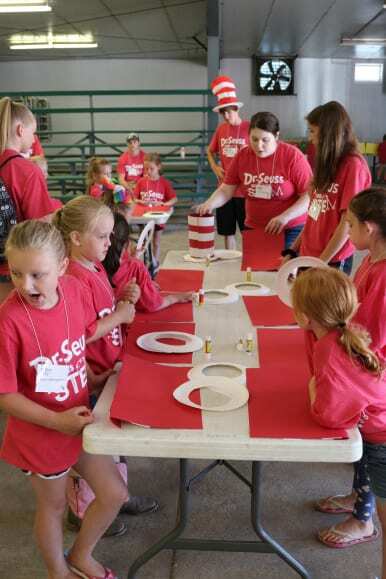 My next project was designing and implementing the STEM at the Fair activities that took place during the Marion County Fair. Running a project from start to finish was a great experience. Some of the activities included making paper airplanes, making straw rockets, playing with robots, making salsa, playing with VR and making meditation bottles. I coordinated the STEM at the Fair activities each day of the fair and assisted with any other tasks around the fair needing attention. I had so much fun getting to interact with the youth at the Marion County Fair.I got to know many amazing 4-H members, families in the community, and Junior and Senior Fair Board members throughout the week. I made a lot of memories during the fair and got the chance to learn in the process. After the fair, there were only ten days until we left for Marion County 4-H Camp held at Camp Ohio. I had never been to Camp Ohio, so it was a whole new camp experience for me. Working with the campers, counselors and adult staff was a real pleasure. Also, I had the privileged of putting together the end of camp video. There were a few late nights of work, but I would not have traded the experience for anything. I will forever be grateful for the opportunities that I had at the 2018 Marion County 4-H Camp. When we returned from camp, I had the chance to help the other educators in our office as well as the SNAP-ED team. It was enlightening to see the different sides of what Extension does to help farmers as well as other community members. Working with OSU Extension Marion County was an amazing experience that I would recommend to anyone. I am thankful to have gotten to spend the summer with a dedicated mentor and meet many wonderful people throughout my internship. Hello fellow Buckeyes! My name is Mary Jenkins and I am a senior in ACEL studying Agricultural Communication with a minor in Spanish. 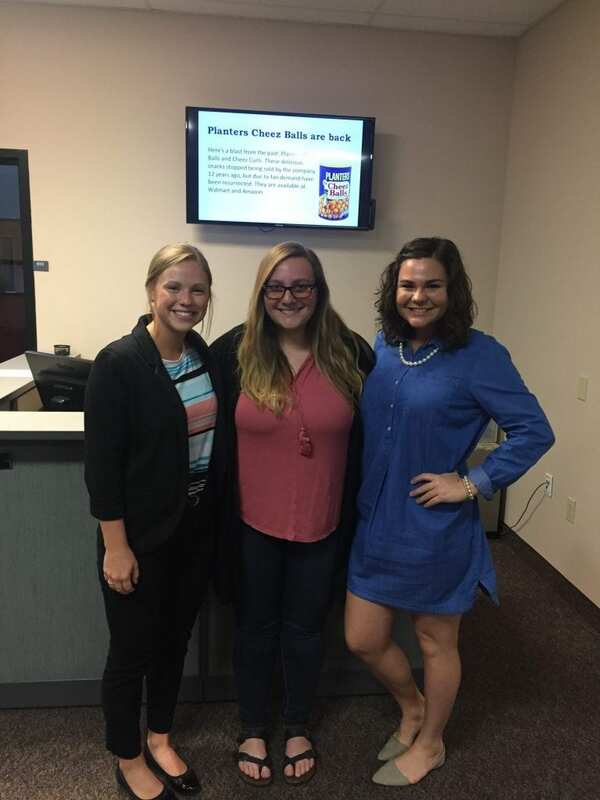 This past summer, I had the opportunity to intern with the Ohio Pork Council (OPC) in New Albany, Ohio. When searching for an internship last spring, I immediately went to Hire-A-Buckeye (now known as Handshake), where I had found my previous internship. The application and interview process were relatively easy and I had a great experience with both of them. Prior to this internship, I had some knowledge of the pork industry, as I lived on a hog farm and showed market hogs for 10 years at the Champaign County Fair in Urbana, Ohio. However, there was still much to learn! Throughout this summer, I primarily worked on communication projects, whether it be press releases, content for the quarterly publication Ohio Porkline, creating graphics, or designing a magazine insert. I loved getting to apply what I had learned in previous courses, like AGRCOMM 4310 or COMM 2221, and seeing how much of a difference there was between course work and projects for an organization. This internship made me even more confident that I had made the right decision to major in Agricultural Communication and eager to begin my career. In addition to those responsibilities, I also spent a few days in Des Moines, Iowa, where I attended the National Pork Board intern training and the World Pork Expo. It was great to see how my work related to what was happening on a national level and to experience a global agricultural event. One of my final projects of the internship was spending time working at the 2018 Ohio State Fair, where I served as assistant manager of OPC’s food stands. My day-to-day responsibilities included training volunteers, counting money, or running supplies from one stand to another. Although not directly related to communication, there were still many transferable skills I gained from this experience, like time management, organization, and attention to detail. All in all, my time as a communications intern with the Ohio Pork Council was a wonderful experience! 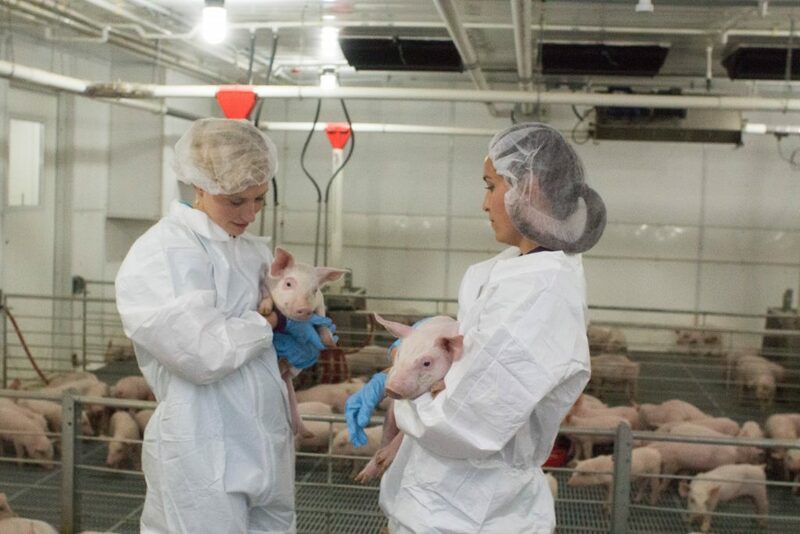 I learned so much about communication and the pork industry that I wouldn’t have had the opportunity to experience had it not been for this internship. If anyone is interested, I encourage them to apply next spring, or to keep their eye out for any internships that might interest them. You never know what you might gain from an experience outside of the classroom. 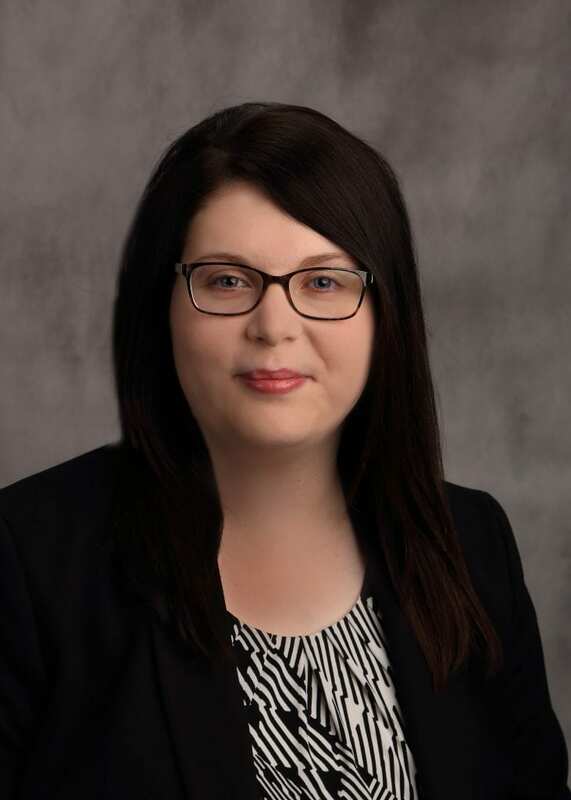 Brooke Rieke Schanowski joined the Department of Agricultural Communication, Education, and Leadership from her hometown of Winfield, Illinois in 2014. 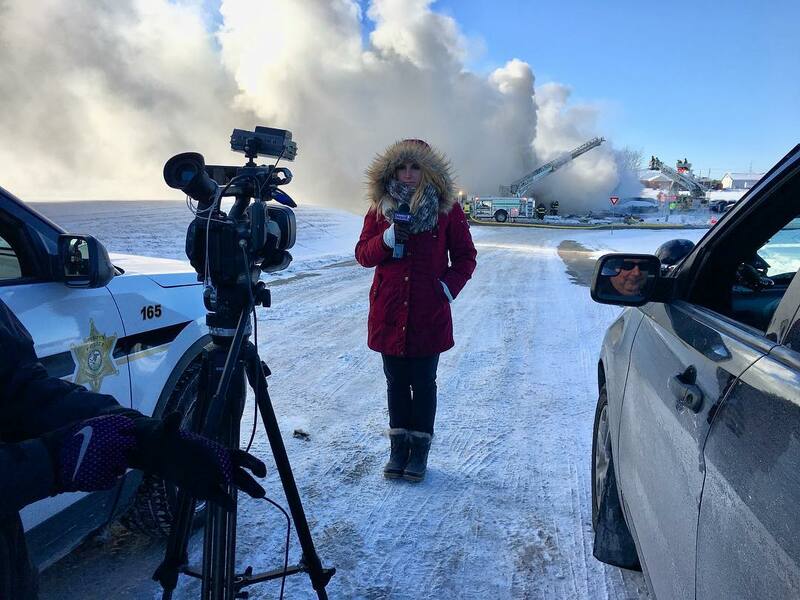 Just three years later, Rieke Schanowski graduated with her bachelors degree in agricultural communication in 2016 and became the the on-air meteorologist and reporter at WMBD/WYZZ TV in her home state of Illinois. [ACEL]: Hi Brooke! 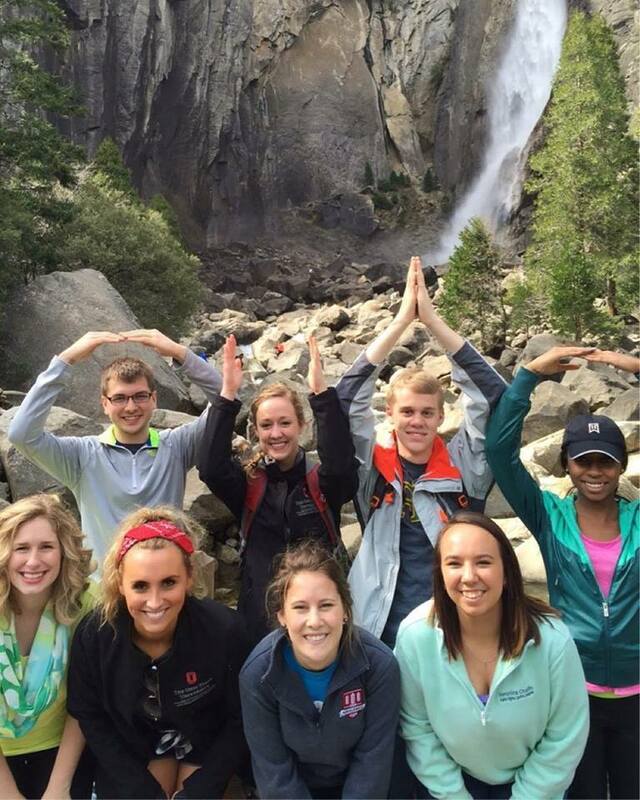 Why did you chose to major in agricultural communication at Ohio State? 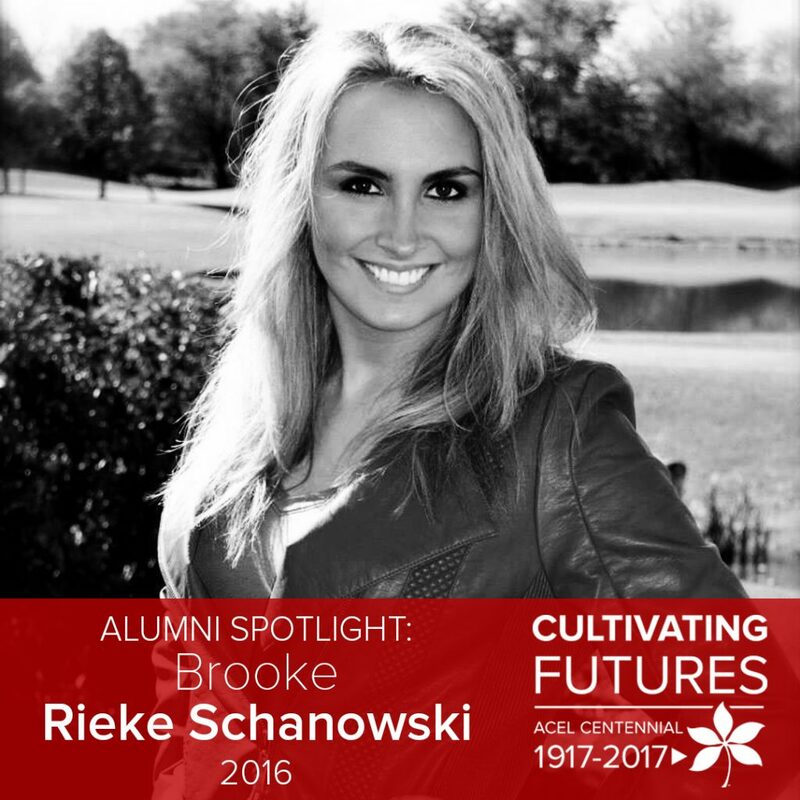 [Rieke Schanowski]: Going to college, I knew I wanted a program that was going to best prepare me to be a meteorologist. When most people hear that I studied agricultural communication, they’re often confused. Honestly, I could not have picked a better program. Not only did I learn how weather impacts agriculture, but I also learned how to communicate complex topics in normal conversation. I fell in love with the Buckeye spirit when I visited. The atmosphere of the campus was infections. Everyone was friendly and happy to be a part of a long-running tradition. How did your education at Ohio State prepare you for your career? It helped me learn that I did want to be a meteorologist. With having two internship experiences (one at ABC 7 Chicago and one at NBC 4 Columbus) I learned exactly what happens on a daily basis at a news station. And the classes I took not only helped me learn certain information, but it made me apply it to real-life situations. In addition to internships and classes, how did you stay busy on campus? I was a CFAES Ambassador, Buckeye Book Community Selection Committee, Media, Marketing, and Communications (MMC) Scholars Program, Real Life, and a CFAES office assistant. What classes did you enjoy the most while at Ohio State? My all-time favorite class was photography with Dr. Buck. First and foremost, I learned A LOT! I loved working on my homework assignments, getting out of my comfort zones and taking pictures of different subjects. But I think my favorite part of the class was the underlying lesson; looking at the world from a different vantage point. Taking pictures, I truly was able to appreciate the beauty of the material. And that’s why to this day I can never pass up taking a picture of a sunset over a cornfield or a forest frosted with the year’s first fresh snow. I also enjoyed Nicole Kraft’s journalism class and Tom Stewart’s public speaking class. What professor had an impact on your education? Dr. Buck had the biggest impact on me. She was just a down-to-earth individual that was truly passionate about what she does. The number one thing I learned was that if you’re passionate about something, nothing will get in your way of reaching for the stars. What is your favorite memory related to your time at Ohio State? I probably didn’t know it at the time, but my favorite memory was when the CFAES Ambassador Team went on enrichment trips. The amount I learned on those trips to California and Arizona regarding the variety of agricultural practices throughout our country; it was incredible. And being placed in an environment that was completely different than the Midwest, it was very interesting to learn all about it. And from those trips, I know not to take anything for granted. Because every place in the world has its challenges, but it’s how you experience it that makes all the difference. What was your first job following your education at Ohio State? My first job (which is also my current job) was an on-air meteorologist/reporter for WMBD/WYZZ TV in Peoria, Illinois. How are you involved in the community outside of your career? For me, it’s important to be involved in the community so that I know the faces of those who watch my broadcasts. My main one is that I volunteer with Goodwill and I am a Goodwill GoodGuide. Every Monday, I meet with a group of students and talk to them about how their week went. We go over important lessons that are pertinent to their lives. Whether it’s job skills, self-confidence or dealing with a difficult situation, we talk about these life events in order to grow as a group. During your career, honors or awards have you been presented? I have received Employee of the Month… woo! As of today, what is your favorite career highlight? Oof… that’s a doozy. There are a few that stand out. But seeing that I am a Chicago Cubs fan, it has to be around our World Series coverage. Fortunately, since we’re an Illinois TV station, we got to do coverage of the World Series for our channel. The day after the World Series win, I got to do a story with a woman who has a special Cubs chair in memory of her late husband. And just talking to her about what that win meant to her, was very special. What advice would you give to a current student? Do something you love. I’m sure you hear that all the time, but seriously, do something you love. Even if you’re passionate about something that you don’t think you can make into your career, try to incorporate it into some aspect of your life. Because I am truly blessed that I get to go to work, and I love (almost) every minute of it. What did ACEL cultivate in you? It may be silly to say, but ACEL has cultivated the Buckeye spirit in me. And for someone who didn’t go to Ohio State, they wouldn’t understand what that means. Let me elaborate. That Buckeye spirit has shown me to work hard for your passion. It has taught me to have a friendly personality and contagious energy. And most importantly, it has shown me how to be proud of what you have accomplished, and what you continue to strive for. Brooke and fellow CFAES ambassadors pose for a picture during an Enrichment Trip to California’s Yosemite National Park. News coverage doesn’t stop for the weather. 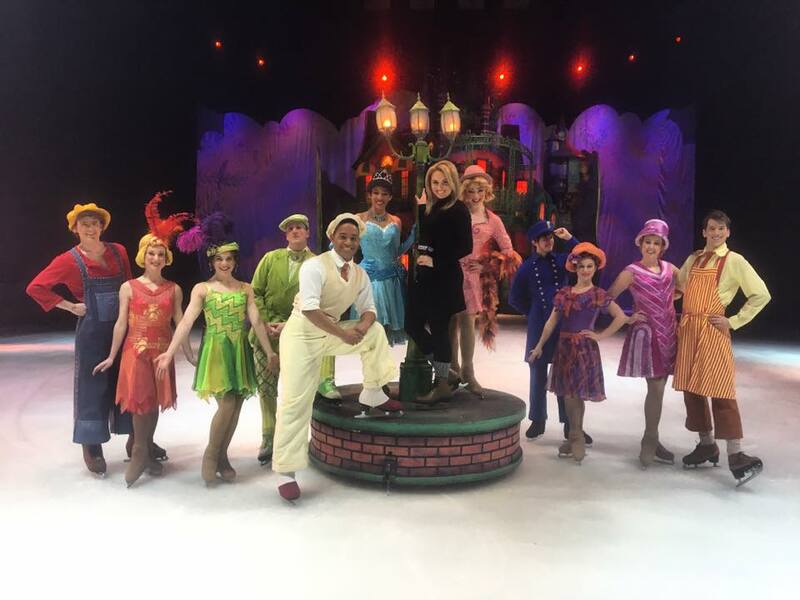 Following a segment with Disney on Ice. 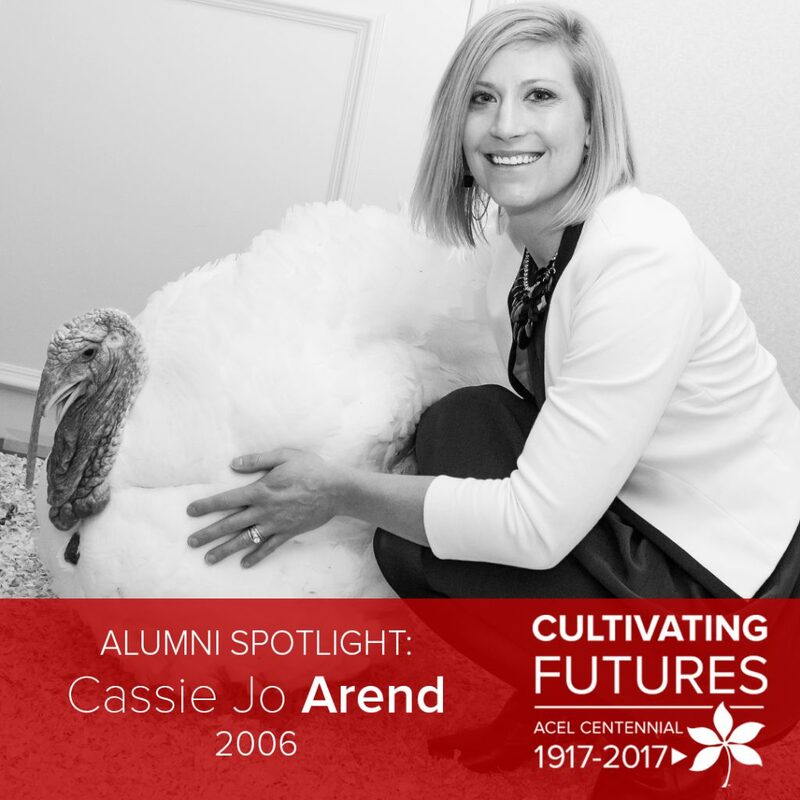 Cassie Jo Colliflower Arend graduated from Ohio State in 2006 with a degree in agricultural communication. 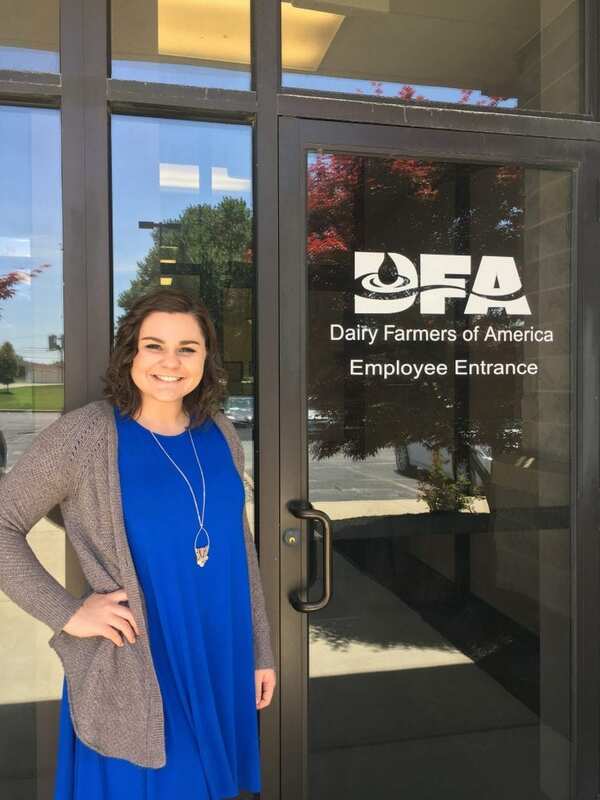 Growing up in Mechanicsburg, Ohio, Cassie Jo now calls Paulding, Ohio home where she works as the corporate communications manager for Cooper Farms. [ACEL]: Why did you choose to attend The Ohio State University? [Arend]: The thing I loved the most about Ohio State from the first time I visited, was how you could be at such a large university, in a big city, and still feel like you are part of a close-knit community. Why did you select your major/graduate program? I didn’t go into college knowing that I wanted to work in communications, or even agriculture. I started with a major in exercise physiology of all things! After my first quarter (yes, we were still on quarters then), I realized that I needed to change paths. 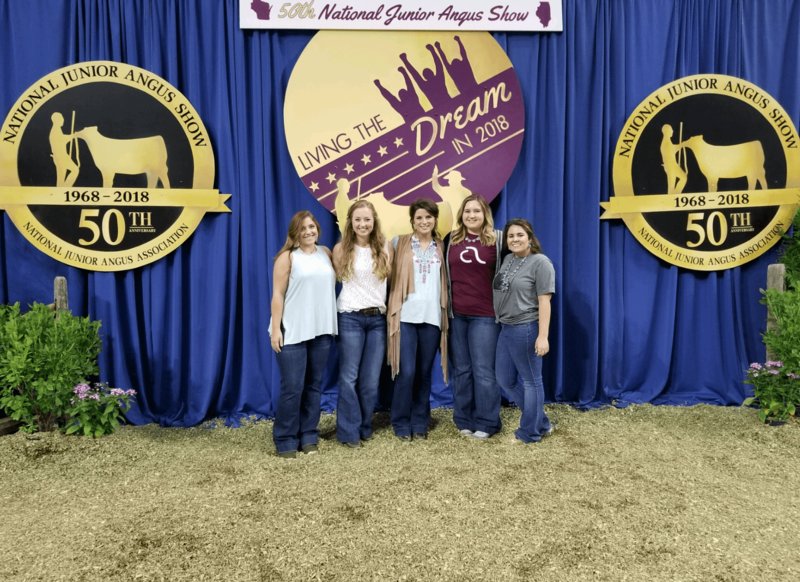 All three of my roommates happened to be agricultural communication majors, so I had the chance to learn about their goals and it was intriguing. I’ve always been creative and loved writing and I had grown a passion for agriculture, so it seemed like a perfect fit. How were you involved in campus activities as a student? I was a member of the Agricultural Communicators of Tomorrow, Saddle and Sirloin Club, Sigma Alpha Professional Agriculture Sorority and Towers Agricultural Honorary. What professor, faculty or staff member had an impact on your education and career? Dr. Mark Tucker and Mr. Tom Stewart both impacted me greatly. Dr. Tucker served as my advisor and helped me to determine my path, internships and so much more. Tom Stewart showed me, and many others, the possibilities of our chosen career path and helped us to see it’s real-world application. Both of the men also had an evident desire to help all of us succeed. That not only helped me in my college career, but taught me a lot about leadership. My favorite memory is the Agricultural Communicators of Tomorrow’s trip to New York City. 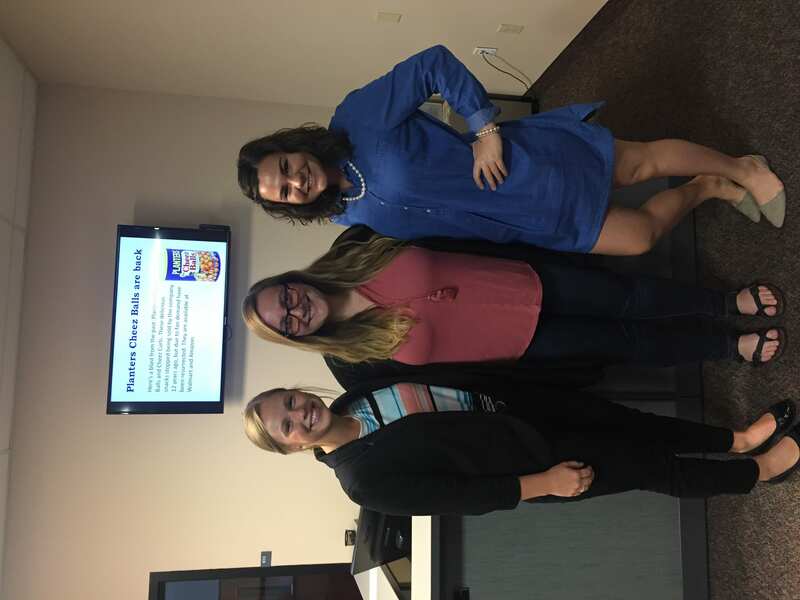 Not only was it fun, but we learned so much and had opportunities to learn about marketing, public relations and television that we could never get outside of that setting. I started at Cooper Farms right out of college. Over the past nearly 11 years, the job has grown and morphed into something I only dreamed of when I started. What no one was certain would even fill one full-time job, has become a department of five helping the company to communicate in all areas. 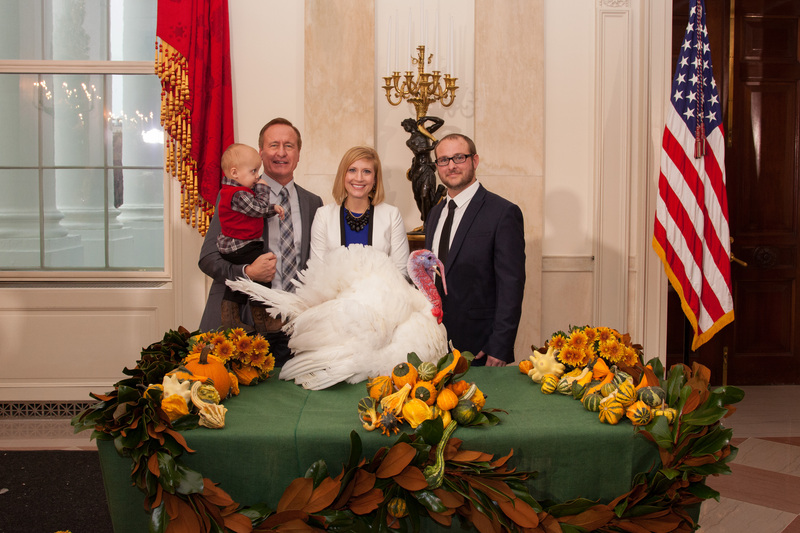 The most memorable experience of my career would have to be when Cooper Farms raised the turkey that would be pardoned at the White House before Thanksgiving in 2014. Gary Cooper was the Chairman of the National Turkey Federation, a position that also holds the privilege of presenting the turkey to the President. We were well aware that raising the “Presidential Turkey” as we dubbed it, wasn’t an everyday occurrence, so we worked to make the most of a time when people would be interested to learn more about turkeys and turkey meat. In preparation, a special, small barn was constructed in June, to show the details of a full-size barn, while eliminating biosecurity risks. Then three of us spent the better part of two months “talking turkey” throughout the state of Ohio. We hosted hundreds of students at the barn and also took a few turkeys on road trips to Cleveland, Columbus and Cincinnati city schools. It was a truly rewarding experience to get to see the kids’ eyes light up as they saw the turkeys in person and learned about them and the Presidential Turkey Pardon. To top it all off, I then had the surreal honor of attending the ceremony inside the White House. Touring the main floor of the White House and sitting feet away from President Obama is something I will never forget. Do as many relevant internships as you can. Internships will help you to see the application from the classroom to your career and it will provide you with tools for your future. I learned so much through my internships, writing for The Lantern and my job in CFAES Government Relations I still apply to this day. ACEL cultivated a deeper passion for sharing the story of farming and agriculture. My time in the CFAES also cultivated relationships and connections that have impacted my life. I love seeing the many ways that I connect with friends from college through my job today. I’m so happy I took the path I did many years ago! Arend pictured with other members of the Cooper Farms family who raised the Presidential Turkey. Arend with the Presidential Turkey prior to visiting the White House for the ceremonial pardoning. Arend at the Cooper Farms hog facilities.